Two sets of the FamilyMart BT01 blister packs. Each set contains 2 booster packs and 3 promotional cards. Japanese cardfighters have begun opening up blister packs from the FamilyMart-Circle K Sunkus collaboration between the eponymous convenience store giant and Bushiroad, and the results are showing a very different distribution compared to normal booster boxes of V-Booster Set 01. A box of blisters contains 10 sets of 2 booster packs each, resulting a 20-pack total rather than the normal 16 found in regular VBT01 boxes. 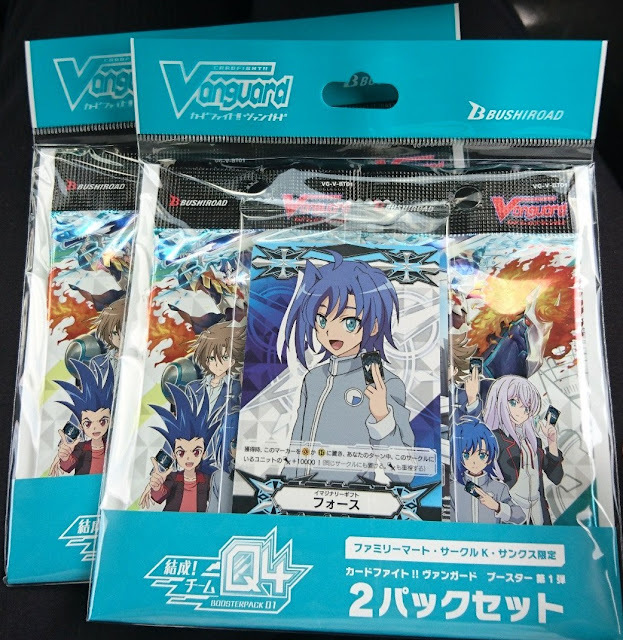 A FamilyMart box contains 1 Vanguard Rare and 1 card that is Vanguard Rare or higher (Origin Rare, Super Vanguard Rare, Image Ride Rare) as well as 3~4 Triple Rares and 7~8 Double Rares. More instances of 4 Triples have been reported thus far than 3. 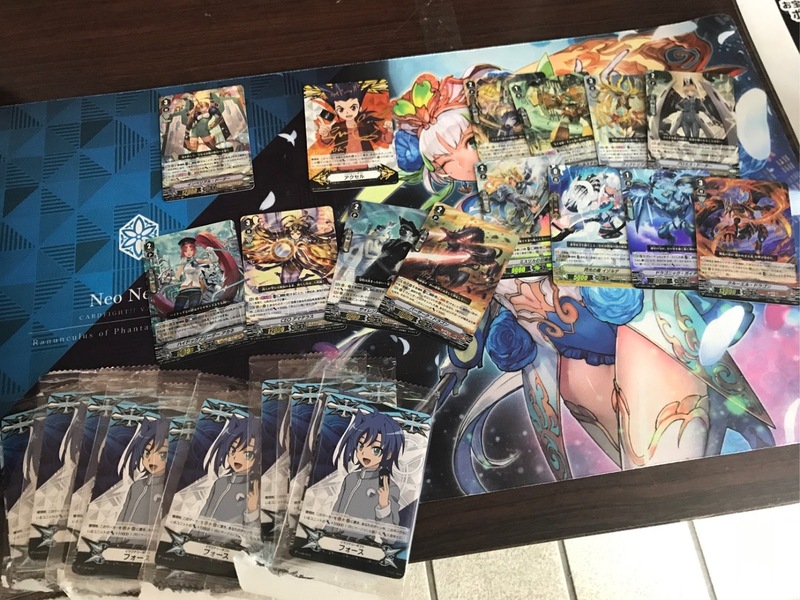 This box resulted in 1 VR, 1 SCR, 4 RRR, and 8 RR, one of the optimal pulls from a FamilyMart box. Case ratios for FamilyMart blisters are unknown. 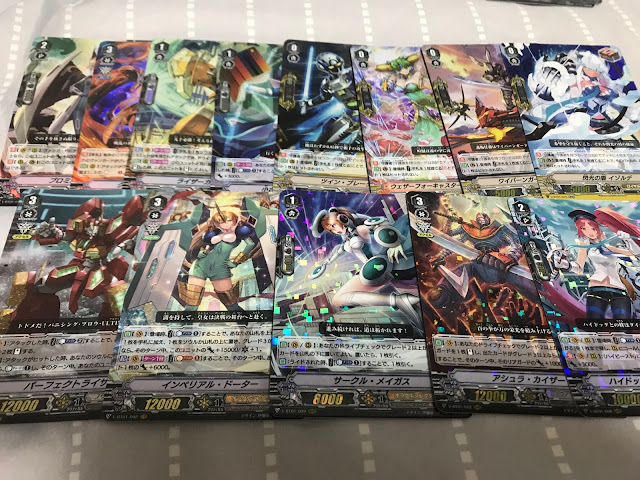 While FamilyMart packs cost 650 yen apiece rather than 300 yen per pack, and thus cost more than buying a pair of packs normally, the fact that every set contains 1 RR or greater and a box of 10 comes with 2 VRs or greater has many fighters rushing to buy as many packs as possible and share the results. An example of 8 RRs (top) 3 RRRs (bottom right) and 2 VRs (bottom left) opened from a box of 10 blister sets. V-Booster Set 01: Unite! Team Q4 launched in Japan May 25th, and will launch in English June 22nd.